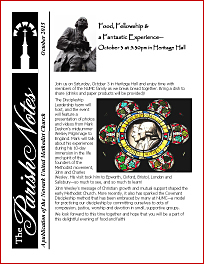 Our church newsletter, Parish Notes, is published electronically just before the beginning of each month. On this page, you can download a recent issue in portable document format (PDF). Acrobat Reader is required to view PDF documents and is free from Adobe. Download Acrobat reader.